Cosmetic dentistry is not just for the celebrities you see on the covers of magazines. At Vista Dental Care, we offer a wide range of cosmetic solutions that brighten, straighten, and perfect smiles within any budget. If you’re interested in finding out more about your options, contact our team to schedule a cosmetic dentistry consultation. We’ll examine your smile, answer any questions you may have, and offer potential solutions to help you achieve your flawless smile. 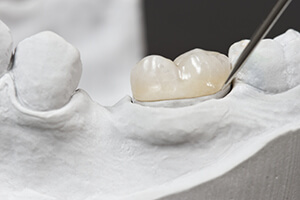 Using the tooth-colored composite that we use to craft dental fillings, we can provide same day cosmetic transformations for patients with minor chips, cracks, gaps, and stains. With minimal impact on healthy tooth structures, dental bonding is one of the most conservative and effective cosmetic dentistry solutions. Veneers are custom crafted from the highest quality, most natural looking porcelain. They are fused onto the surfaces of teeth to conceal and correct any number of smile flaws instantly. Designed to recreate your natural dental structures, porcelain veneers give our patients perfect smiles that can last for years with proper care. As part of our ongoing commitment to providing conservative treatment options, inlays and onlays allow us to provide a solution between tooth colored fillings and more advanced dental crowns. Inlays repair damage to the insides of the tooth, and onlays repair teeth that have damaged cusps (raised dental structure on the biting surfaces). 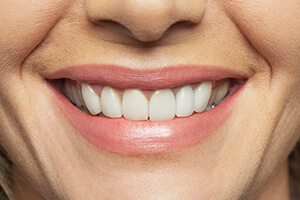 A straighter smile looks great and functions even better. 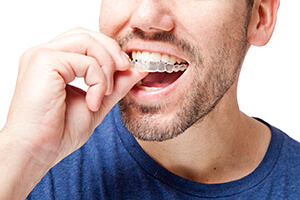 Rather than using a series of metal brackets and wires, the Vista Dental Care team can straighten smiles with the clear alignment tray orthodontic system, Invisalign. Not only is Invisalign a more subtle orthodontic solution, but it has little or no impact on the day to day routines of patients. Traditionally, most patients expect big changes to their teeth to take lots of time and multiple appointments. Thankfully, this doesn’t have to be the case here at Vista Dental Care! If you’re in need of extensive cosmetic treatment, Dr. Marc Thomas can work with his staff to arrange your care in a single day, which means you’ll be able to walk in with a lackluster appearance and walk out with the dazzling improvements you’ve been dreaming of – no tedious waiting required. Before treatment, the patient will need to attend a consultation with Dr. Thomas so that the services you need can be determined, combined, and scheduled in the proper order. We look forward to bringing out your smile’s full potential in record time!